PMA, Jackson, Mich., has released the Monthly Printing and Camera Trends Report covering highlights and overviews through July. According to the report, the volume of all-sized prints made from digital camera images increased 21 percent in July. Online ordering activity grew at the rate of 47 percent, and printing volumes at retail minilabs and instant kiosks also increased. The retail channel accounted for 50.1 percent of prints, with 14.7 percent of customers using kiosks to make prints. Overall camera sales were up .6 percent in July, with digital cameras dominating the sales mix. entire report is available online from PMA Marketing Research. Click here to instantly order Kodak quality pictures online from ScanMyPhotos.com and 30 Minute Photos Etc. When visiting the ScanMyPhotos.com "Make Something Kodak" retail photo center in Orange County, Calif., customers can create Kodak prints, greeting cards, calendars, picture movie DVDs, and photo books, as well as edit images. We pause from our regular Tales From The World of Photo Scanning postings for this narrative on what recently happened in Las Vegas. It involved Cher and a lesson about customer service that resonated with our company's founders. With all the domestic and international ScanMyPhotos.com orders, like any company, there may be times when we fall short of a customer's expectations. There is much to learn about how quickly and thoroughly a company responds to each customer experience. In the case of ScanMyPhotos.com, our Live Support and Internet accessibility helps remedy every customer concern. It is based on a foundation of more than 18-years in business that provides a blanket of solutions to each concern. While literally more than 99% of every customer experience is favorable, it is always the challenging episode from which we learn most to enhance our service and improve our systems. Last week, during a trip to Las Vegas, ScanMyPhotos.com company president and CEO had an experience that we wanted to share with you. It was a lesson on how not to handle customer experiences. Mr. Goldstone was staying at The Bellagio Hotel and preparing to enjoy Cher's performance at The Colosseum at Caesers Palace in Las Vegas on September 24th. After an early dinner and stroll next door to watch the show at Caesers, at the last minute, his group learned the evening performance was cancelled. Caesers' employees standing at the entrance to the theater explained that the entertainer was not feeling well. It seems that this had occurred with two previous shows earlier in the week. It was a disappointment, but also, a lesson learned. While Ticketmaster charges a myriad of fees, including a "convenience fee," you would think that service would include notifying ticket holders when a show is cancelled at the last minute - after all, they request your cell phone number and email address. Instead, no refund was forthcoming for what are very costly tickets. Several days later, Mr. Goldstone had an assistant call Ticketmaster to learn that a "mass credit" for the cancelled shows had not yet occurred. However, the world's leading live entertainment ticketing company would issue a full refund, less the "order processing fee" and the "ticket delivery charges." Rather than an instant refund, it will take several days for the partial refund to be passed along to the credit card. This brought home how different smart, entrepreneurial companies, like ScanMyPhotos.com can be. "If Ticketmaster wanted to gain windfall customer satisfaction, they should have minimally notified each ticket holder that the show was cancelled - before the guests arrived at the theater," suggested Mr. Goldstone. "I am also surprised that it took a phone call to request a refund, and that they are retaining those two extra charges. I just hope that Cher is feeling better so thousands of her other fans are not equally disappointed," he said. Click here to read more about Cher's missed performances in "Las Vegas Weekly." Update: Cher has also cancelled Saturday and Sunday's performances according to the CherWorld.com blog posting. Read about Lisa from Seattle Washington's experience with ScanMyPhotos.com in her own words that were posted on her "BlondeLawyer" blog. Thanks Lisa for having ScanMyPhotos.com help digitally preserve your special photo memories. On your next order, check out our menu of other useful features, like Photo Soap, custom photo albums, photo restorations , Kodak Picture Movie DVD's and more great ideas on this page. "Like many people we lots of old pre-everyone-has-a-digital-camera-days photos sitting around. We have had "scan in photos" on our "to do list" for a very long time (it is even on my 101 list!). So when I heard about a company that does it for you and is reasonably priced, I was all over it! In August there was an article in the NY Times about scanmyphotos.com, so I decided to check it out. You have to arrange your photos by size, which took some time, but in the end it was well worth it. Last Thursday I mailed out 11 pounds worth of old photographs. Today when I arrived at my office my photos were returned along with a DVD with all 1368 photos on it. The quality is pretty good and the turn around was so fast. The total cost--about $140 (which included shipping both ways). Well worth it IMHO. So, now you will get to see lots and lots of old photos--including never-before-posted wedding photos from my 1999 wedding...I bet you are on the edge of your seat!! Anywho...I am excited about being able to post all of these old photos. And also to play around with editing them in Photoshop!" Click here to view a sample of Lisa's photo scans. ScanMyPhotos.com offers our famous photo scanning service around the world to all locations included on the Federal Express Priority International delivery system. We make it easy to digitally protect your photos. Pay just $49.95 ($US) for up to 1,000 photos scanned, providing it is prepared as detailed in the below link. Have as many photos scanned as you want, pay just $49.95 ($US) per up to each 1,000 photos. Includes one DVD data disc of your scanned images. From Polaroid-sized 3’ x 3’ to 11x14 enlargements. Front and back scanning only available with this option at additional cost. No prorating and our prepaid, fill-the-box service is not valid, you must send the photos in your own box and we return only via FedEx Priority International delivery. All International orders must choose this option. Click here for more info. Before ordering, please click here to read the requirements on how to prepare your photos for scanning. Prepare your photos as detailed here. Fill out this order form and be sure to choose FedEx Priority International for return shipment. COLOGNE, Germany, Sept 23, 2008 /PRNewswire-FirstCall via COMTEX/ -- Eastman Kodak's award-winning KODAK Adaptive Picture Exchange (APEX), a powerful modular, thermal dry lab system, has quickly become the most widely adopted new dry lab system in Europe according to FutureSource Consulting. Kodak achieved this lead position in less than four months since the first APEX shipment in June 2008. This behind-the-counter solution mirrors Kodak's leadership position in front-of-the-counter kiosk solution, with more than 90,000 units installed worldwide. "When we first conceived the Adaptive Picture Exchange, we knew retailers would need a digital printing solution that helps provide dramatic profitability improvements while minimizing capital expenditure and risk, in order to position themselves for today and for the future," said Brad Kruchten, general manager, Retail Printing and vice president, Eastman Kodak Company. "With APEX, we've delivered a solution that allows retailers to leverage their existing capital investment as their starting point to access new and highly profitable business opportunities. It's an honor to see that key retailers globally recognize our efforts, showing that they trust us to quickly assess the rapidly changing market needs and bring them relevant, timely and profitable solutions." The KODAK Adaptive Picture Exchange, which combines unique technology innovations with Kodak's award winning applications and retail systems expertise, embodies Kodak's commitment to retailers to deliver unprecedented adaptability, ease-of-use, flexibility and scalability while enabling quick and easy production of profitable, high quality imaging products and dramatically reducing retailer costs and complexity. As a result, retailers have responded strongly to the benefits the system provides, including reduced setup and training time, increased employee productivity and increased efficiencies and profit from the combination of new simple user interface design, substantially reduced number of media types, the connectable and modular small footprint core design and low capital cost. "It's very important for us that the new solution not only processes the images quickly, but that it is also very customer friendly and easy to use via a touch screen," said Frank Boehm, managing director of Media Markt Schwerin in Germany. "More and more of our customers want to do more with their photos. We are happy to meet this demand and offer additional services, with brilliant products at premium quality, to our customers through the APEX." New components within the KODAK Adaptive Picture Exchange include the KODAK 7000 Photo Printer, KODAK XTRALIFE II Paper, KODAK DL2100 Duplex Printer, and new KODAK Adaptive Picture Exchange/APEX Workstation with advanced high-speed processing capability and efficient workflow software, all in a highly ergonomic and easy-to-use overall design. The Adaptive Picture Exchange allows retailers to scale from low- to high-volume environments as business needs expand. Because the components of APEX are so modular, a retailer can choose from dozens of configuration options to best meet their needs. "I developed my new shop at the same time Kodak developed APEX, which was very fortunate," said Robert de Klijne, owner of Foto Fun Store. "The APEX is an incredibly good concept that takes the work out of my hands. It ensures that I no longer need an operator. The operator has become a salesperson. With APEX I've got my hands free to help customers." The new KODAK Picture Kiosk v2.0 Software Upgrade for the KODAK Picture Kiosk encourages consumers to make premium products easily through dedicated attract loops and premium product visualization with customer images - right at the order summary. It delivers improved workflows that make it easier for consumers do what they want, from finding their important pictures to stunning premium product items, quickly and easily. The software also enables direct G3 and G4 series kiosk connectivity to the KODAK DL2100 Duplex Printer, allowing retailers to leverage their existing KODAK Picture Kiosk hardware investment as the basis for expansion into fast-growth double-sided photobooks, greeting cards and calendars right in the store. In addition, the new software also enables ordering of exciting off-site photo-merchandise that deliver even more profitable retailer opportunities while delivering on the promise of consumer digital photography. ROCHESTER, N.Y. & COLOGNE, Germany, Sep 22, 2008 (BUSINESS WIRE) -- Eastman Kodak Company today unveiled comprehensive and innovative imaging solutions for consumers, retailers, and creative professionals at Photokina 2008. The Kodak booth (Hall 5.2) includes ultra crisp digital displays, wireless inkjet printing, new film capture options, and high-value photo products. Overall, the company reinforces its mission to provide consumers, professionals and retailers with innovative products and services that help them to make, manage and move images and information, both at home and in the retail environment. "People are taking pictures in more ways, in more places, and on more devices than ever before," said Pierre Schaeffer, chief marketing officer, Kodak's Consumer Digital Imaging Group. "Our job is to make sure that whenever people interact with images -- whether they're capturing, printing, or sharing -- they have exciting, high-quality and easy-to-use choices that enable them to share their life stories with friends and family across the globe." -- The new KODAK OLED Wireless Frame, the first-ever Organic Light Emitting Diode frame, which displays images and videos in ultra-crisp quality for an unparalleled 180-degree viewing experience. -- The new KODAK ESP 7 and 9 All-in-One (AiO) Consumer Inkjet Printers, which take home-printing ease, quality and affordability to the next level with wireless printing and a 10-inch, one-touch control panel. -- The new KODAK PROFESSIONAL EKTAR 100 Film, which is the world's finest grain color negative film, achieving high saturation and ultra-vivid color for unbelievable detail and amazing high-quality enlargements. In addition to enabling people to easily capture video and still images, Kodak offers retailers adaptive and proven photo printing solutions that provide unprecedented ease-of-use, flexibility and scalability. These solutions enable them to produce profitable, high-quality photo products while minimizing cost and complexity. -- Now available in Europe, the KODAK Picture Movie DVD, combines original artist music and consumer pictures into a powerful and emotional movie, playable on any DVD player, in minutes, enabling retailers to offer personalized photo-products. -- Following its market delivery in June, the configurable, easy-to-use KODAK Adaptive Picture Exchange (APEX) has quickly become Europe's most widely adopted dry-lab solution. The APEX system lets retailers choose the appropriate level of investment and scale capacity as needed, while offering a broad array of digital printing capabilities. -- The new KODAK Picture Kiosk v2.0 Software provides enhanced workflow improvements and new product offerings through offsite gifting solutions. The software upgrade includes new retailer-friendly features such as intelligent upsells, powerful new attract loops and the ability for retailers to enter the world of in-store photo merchandise without major capital. -- Retailers now have access to Kodak's Graphic Communications Solutions to supply premium-quality photo books to meet growing consumer demand. These solutions include the unique KODAK NEXPRESS Intelligent Dimensional Coating Solutions that reproduces images with a dimensional feel that mimics the surface of items in a photograph. -- The new KODAK Express (KEX) Experiential Store design and the new KODAK Creative Production Software will benefit photo specialty retailers worldwide. The store design concept, which blends consumer shopping preferences with Kodak's latest products and services and a fresh layout, helps make KEX stores the imaging destination of choice for consumers. The new software solution enables retailers to easily create, manage and move consumer orders both in and out of store with connection to offsite fulfillment as well as new or existing in-store hardware, minimizing capital outlay. will benefit photo specialty retailers worldwide. The store design concept, which blends consumer shopping preferences with Kodak's latest products and services and a fresh layout, helps make KEX stores the imaging destination of choice for consumers. The new software solution enables retailers to easily create, manage and move consumer orders both in and out of store with connection to offsite fulfillment as well as new or existing in-store hardware, minimizing capital outlay. The reason we have been in business since 1990 is uncompromising customer service. But, the best way to learn about a company's genuine care for customers and their photos is how things are handled when there is a problem. We just received this email from a local customer in southern California. Typically, all walk-in photo scan orders are ready within minutes (we scan 1,000 pictures in 15-minutes). There was a delay on Saturday with an order and here, in their own words, is how ScanMyPhotos.com handled the delay. Thank you for getting those out this morning-I really appreciate it. No need to apologize-I completely understand. I should apologize for keeping you and your employees past 3pm. Thank you for trying to get them to me same day. pleasantly surprised to find my order had been discounted and again, Cesar apologized for the inconvenience. WOW. Mitch, you and your team went above and beyond simple customer service. From the way your staff handled a delay, to the attention to every detail-from offering a bottle of water why I waited, to the discounted price, the gift cards and now I see-even a DVD. Thank you for re-affirming that people still care about the customer and take pride in their jobs. It’s refreshing. A loyal customer for life-John M.
The power of PR: Mitch Goldstone, president and CEO of ScanMyPhotos.com and 30 Minute Photos Etc., discusses how to use PR to your advantage in this September, 2008, Page 56 column in PMA Magazine. Imagine either the desolate sound of chirping crickets or the buzz of crowds queuing up to shop at your store, just as they steadily do at the world’s smartest retailer, The Apple Store. a gripping experience, and an urgency to check out your photo center. lucky winners confront when recognizing they hold the winning lottery ticket. There is a special buzz, excitement, and something new to discuss. The foundation for building such fervor takes a great deal of time and study. It requires having a new story to tell, a sensational selling proposition, and public relations way beyond the normal scope of reach. With the hastening decline in standard print media, it is becoming more difficult to score that coveted human interest story; but you can take advantage of social networking bloggers, community groups, and literally thousands of other new opportunities. Public relations today is more than getting your store mentioned in the local paper. My company is regularly featured by the national media, including stints on the “NBC Nightly News with Brian Williams,” the “Today Show,” and various radio interviews. We got into The Wall Street Journal, USA Today, and The New York Times because ScanMyPhotos.com and 30 Minute Photos Etc. have something newsworthy to discuss. Sometimes we even create news events, but we always make sure the PR topic is interesting, compelling, unique, and newsworthy. Make sure your PR campaigns pass the test of what interests you. If you would just turn the page, don’t waste the media’s time. The goal of smart PR is to make noise, be heard and, most important, make money – that is the score to identify what is working. To achieve this, get out of the commodity business of standardized PR and think beyond what many call “duct tape PR,” where each media experience is a quick, one-time fix. Most PR campaigns require priming the pump and investing in research and innovation. You already accomplished the first step by being involved in PMA; you have earned the credibility and connections to get on the map. Now, you need to work on a strategy to score the ultimate PR coup – having the media call you first. It is easy to make news – just have something new to talk about. represent what modern consumers want? For my company, we invested in the newest technology powered by the Kodak APEX modular dry lab solution. It is cost-effective and eco-friendly. It also represents the future of our industry, and takes no time to create buzz and excitement from employees and customers. For us, it was all about unloading our traditional chemistry processors for this new solution. It is seamlessly networked to Kodak Picture Kiosks so our customers can make something from prints and enlargements in just seconds. Smart PR means doing your homework. Read everything from local papers, MySpace, Facebook, and blogs. Follow events in your community. Get to know reporters and regularly communicate with them to comment on prior articles, even by replying to their online article comment sections. Do this first without a story pitch. It is far better to get to know reporters and bloggers initially, rather than only responding after a story appears to haunt them for forgetting to include you in a previous profile. Once you have hard news, reach out and share the excitement of the pitch and the sizzle with them. Be unique. Tell a story and personalize it with customer experiences. Explain why one customer literally wept when you handed her the newly restored image of her grandparents, or scanned generations of family snapshots so she could instantly view them and create photo product on your kiosks. Smart PR is about personalizing, educating, and solving problems. Make sure your message is articulated well and with good grammar. Always be professional, accessible, and courteous of reporters’ time. If all else fails, write your own formatted news profile and post it on your business website. You can also publish your perfectly formatted news release on your blog to control the exact message you seek. PR, however, is more than a press release. Today it is about email blasts, social marketing, online paid searches, YouTube “how-to” videos of your store, and using services like PRWeb.com and MailerMailer.com. If you want to know which PR campaigns are the most effective, ask your customers. They will be happy to share their feedback and tell how they learned about your company. Have fun and be persistent and patient. Your PR journey is the whole process of making news. Your goal is not to collect news clippings, but to get noticed and to build profits. Thanks Gloria for your below posting. "I learned of an Irvine, California company called scanmyphotos.com while reading an article called “Your Photos, Off the Shelf at Last,” by David Pogue in the August 13th edition of The New York Times. This company sounds too good to be true - but apparently they are and it is. I suspect if others react to what this company offers as I did, the company is going to be flooded with work. Here’s what they offer: Scanning 1,000 photos, burning them to a DVD, and charging you $50 for it! Is that the deal of the year? The decade? There are requirements — things like the images need to be between 3×3 to 11×14, bundled together in like sizes, cannot scan from a photo album, and so on. They also scan slides, negatives, VHS to DVD (ooh … that comes in handy). Is it just me? Or are you now adding another item to the “to do” list? I read the article and checked the site. It does seem too good to be true.I’ve put it on my to do list. That is such a deal!! My husband has a slide scanner. He puts in four slides at a time and it is SLOW!! thanks for that! enjoyed your work at the LB Quilt Festival. both the larger geometric quilts and especially the small journal pieces from 2005. were you at the show? Everyone loves to share their pictures. But not everyone is as careful with your prints as you are. You want to protect them for years to come. Don’t worry! Prints from the KODAK Picture Kiosk are coated with KODAK XTRALIFE™ lamination to be especially durable. Real KODAK pictures with XTRALIFE™ lamination are waterproof. We just wiped the water off—no damage to the quality of the picture. Prints from the KODAK Picture Kiosk are also wipeable. So fingerprints, smudges, liquids, and even mustard will wipe right off. Get real KODAK Pictures right from your phone. Real fast. Got a great shot on your phone that you want to turn into a great print? It’s quick and easy. Walk right up to the kiosk. Beam your favorite pictures right to the screen using Bluetooth technology, and the kiosk does the rest. In just seconds you can turn those temporary, candid snapshots into real KODAK Pictures. Everyone will want one. Due to the changing size of images that phones and other mobile devices can capture and transmit, making prints can be a challenge. KODAK Kiosks will notify you if the resolution of your phone image is not sufficient for the print size you select—and recommend options for KODAK Quality Prints. Zoom in on the important details in your picture. Crop out unwanted backgrounds. Or, use these simple tools in creative ways to highlight something special in your picture. Just touch the screen to get the result you want. It’s the most common problem with photos that people want to fix. We’ve made it so easy to remove red eye. Just touch the screen to highlight the eyes in your photo. Touch “Remove Red Eye” feature on the screen. It’s gone! Change color photos to black & white or sepia in seconds. Start with a color photo and create a black and white print for a classic, creative look. Create an aged, warm look from a color photo with our Sepia feature. Make your picture as vibrant as you remember it. Just touch the screen to adjust levels of contrast, brightness, and color. You can also get creative and change the amount a color in your photos for a very custom look. Add a special message to your photo in just minutes. Create a unique look. You choose the style and color of the message. Add special greetings, fun captions, and important dates. Preview your creation onscreen before you print and pay. "Don't just look at pictures.... Relive your memories" with KODAK Picture Movie DVDs. Click here for an informative video and sample. Order your own multi-media KODAK Picture Movie DVDs from your favorite 60 pictures, includes your choice of music from popular artists and all orders are completed almost instantly. The KODAK Picture Movie DVD even includes special pan and zoom effects for a true movie experience. That’s all there is to it! Watch your favorite photos on TV. Ordering is super-easy and super-fast. Why only 60 pictures? Even though the average ScanMyPhotos.com order is about 2,500 images scanned, we have found that to retain viewer interest and preserve the special impact that the most important photos represent, 60 pictures is the perfect quantity, without having your guests' eyes begin to close. All ScanMyPhotos.com pictures are scanned at 300 dpi. The final file size will vary depending upon the size of the original photograph. A standard 4x6 usually is about 1 to 1.5 MB in size. Many websites refer to resolution as a pixel by pixel notation. To determine what your own picture's pixel by pixel resolution will be, multiply the inches by 300 dpi. For example, a 4"x6" print will have a resolution of 1200x1800 (4" x 300dpi = 1200 pixels, 6"x 300dpi = 1800 pixels). Are my photos returned to me? Yes, your photos are returned to you along with the digital CD-Rom/DVD of your scanned photos. We do not offer a service dispose of or keep your photos. All photographs will be returned with your order. What size is the regular prepaid fill-the-box ScanMyPhotos.com package for the $124.95 option? Regular Photo Box(fits more than 1,600 4x6 photos)Inside dimensions - 11" X 8.5" X 5.5" All orders are processed and mailed out the same business day it is received *domestic U.S. orders only). International orders do need to select "Option #2." Photo scanning is typically completed and mailed back the same business day it is received. Based on your quantity of slides or negative scanning, it typically is completed within several days and mailed back the same business day it is completed. Please note that we do not have any control over the United State Postal Service or any other courier or transport companies and therefore cannot be held responsible and we do not warranty or guarantee deliveries to or from our location; items misplaced while in their care are also not warranted. [See bottom of this link for limit of liabilities]. 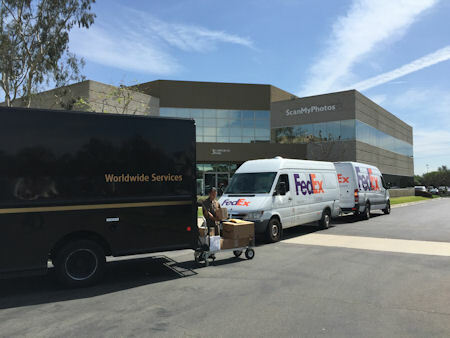 All work is received, processed and mailed back from our Irvine, California headquarters. Most services, including photo picture scanning, reprints, enlargements, photo memory books and photo cards are rushed with our super-fast same day service. Photo restorations and slide and negative scanning orders take just a little bit longer depending upon the individual order. We do feature a Rush – next-up scanning service, which moves you to the top of the line; see the “Option #2” order form to choose this feature. Are these scans designed for personal archiving and sharing, or can I make giant museum-quality poster enlargements from the files? These high-speed photo scans are designed to digitally preserve your regular photos. This is not designed to archive professional images with museum-quality clarity. There is no refund for high-speed photo scans and you understand and agree that we cannot guarantee the image quality of the reproductions or individual quality control your files due to the extremely high volume scanning operation guarantee the image quality of the reproductions or individual quality control your files due to the extremely high volume scanning operation. Can I use the newly scanned digital DVD to view my photos on the TV with my DVD player? The DVD we provide you with is not a video DVD. It is only a DVD with your JPG files on it. There is a number of slideshow creation software available that would allow you to create a movie for your DVD player to watch on a TV, but we do not provide this for you. Some examples would be iMovie ® or Nero PhotoShow ®. However, some newer model DVD player do have a slideshow feature but most limit the number of photos that can be loaded, usually well below the 1,000 mark. In our experience, most DVD players will not load more than 200 images.